Sake lovers might not want to miss the rare opportunity to taste Japanese dishes made using Dassai 23 sake kasu (the lees or solids that are left after the sake is pressed from the fermented mash). On Tuesday, November 24, a tasting at The Japanese Culinary Center will feature sake kasu-marinated black cod and chicken as well as a salmon sake kasu nabe (hot pot). Attendees will receive a free package of sake kasu for at home use. For more details please visit the Japanese Culinary Center website. Dassai 39 Sparkling Daiginjo Nigori (Yamaguchi) — Every holiday begins with a kanpai/toast and this expressively effervescent sparkler which strikes the perfect balance between sweet and dry is not only a festive aperitif, but is also a great match with hors d’oeuvres to serve as you welcome your guests. Akita Bare Suirakuten Junmai Daiginjo (Akita) — To complement your first course, serve this elegant, gentle, compact brew with a clean dry finish. After tasting this sake, you’ll want to add it to your list of reasons to give thanks. Housui Tokubetsu Junmai (Tokushima) – As an alternative or a second option for the main course, this aromatic, silky, slightly sweet sake’s peppery flavor and long finish also has the acidity to stand up to the richness of traditional Thanksgiving fare. So, try sake this Thanksgiving. You may find yourself thanking the Japanese for something on this quintessentially American holiday. Perhaps if all those wine writers did the same, they might come up with a new answer to the annual question. Please come visit us for specific suggestions for sake ideas to match your menu. Our friend Harris Salat, author of The Japanese Food Report, has teamed up with Chef Chikara Sono of Kyoya and Saveur magazine to produce a fascinating workshop on preparing, curing, and serving fish Japanese-style. One of SAKAYA’s earliest supporters, Henry Sidel of Joto Sake will serve and discuss the sake to pair with the dishes that participants will learn to prepare in the Saveur test kitchen. The workshop will be held on Monday, December 7, from 7 – 9:30PM. 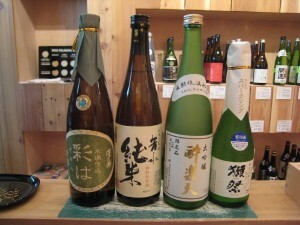 The more familiar you become with sake, the more you come to find how many different approaches there are to making it. While brewing a beverage from rice, water, yeast, and koji may seem relatively straightforward, there are an unfathomable number of variations on the basic method (if there is such a thing) used by brewers to create their own unique sake. To add to your experience we’ve scheduled a variety of sake, each with its own “recipe” and story behind it. Please join us to taste them and hear what was done to give them each their own distinct aromatics and flavor profile. You are currently browsing the Sakaya NYC Blog weblog archives for November, 2009.